Do you need high speed Internet or Wi-Fi in Boulder City? LV.Net has been providing the best in Internet service for over 18 years. LV.Net’s high speed wireless microwave Internet can provide high speed Internet service of the highest caliber in Boulder City. Technicians at our company are trained and experienced. They are available at all hours of the day, every day of the year. Technical staff at LV.Net maintains the microwave network and keep it running regardless of the weather or climate. LV.Net’s high speed microwave network operates through a series of radio relays located throughout Nevada. Microwave signals travel at close to the speed of light between relays that are miles apart. There are no maintenance issues involving fiber optic cable over distances that signal travel wirelessly. LV.Net’s microwave network can provide speeds of up to 1Gbps without difficulty. Our microwave network is designed with high flexibility and redundancy. Because the transmission that provides high speed Internet is wireless, it is able to reach areas that fiber optic cable cannot. Providing high speed microwave Internet in remote locations is not a problem. By choosing microwave Internet service, there is no concern about the cost or inconvenience of installing fiber optic cable in order to receive the best in high speed Internet. A microwave connection is quick and easy for our technicians to be installed, and can sometimes be set up in as little as one day. LV.Net’s microwave network spans the entire state of Nevada. It extends into some parts of surrounding states such as Southern California and parts of Arizona. LV.Net is very interested in serving rural areas that do not have ready access to fiber optic cable. Sometimes the cost and inconvenience of installing fiber optic cable in these areas are prohibitive. Additionally, high speed wireless microwave Internet from LV.Net is a good alternative to fiber optic cable in areas where fiber cable is available, and makes very good redundant backup Internet where other Internet service is in use. High speed wireless microwave Internet can be installed in almost every type of location and building. This includes office complexes, multi-story buildings, homes, motels, hotels, remote areas, campgrounds, parking lots, RV parks, and more. LV.Net’s microwave network uses a redundant power supply. Licensed carrier-grade radios are used on major backbone points. Equipment is configured to report and alert of usage or port errors when pro-active management features are available. The microwave network’s equipment is standardized and kept in a “cold spare” state. This allows our network administrators to decide whether to use duplicate equipment in any particular situation involving equipment performance. OSPF protocol and mesh topology is used on towers with multiple transit links for failover. Private point-to-point business networks are available in Boulder City. These can provide for high speed back up Internet, data storage in LV.Net’s secured, environment-controlled facility, or cloud computing options. The wireless microwave connection can provide bandwidth of up to 1Gbps, and installation is hassle free. Virtual private networks can also be set up. Virtual private networks use an Internet connection to establish a network with equipment located on LV.Net’s premises. Virtual private network signals transmitted over the Internet are encrypted for security. 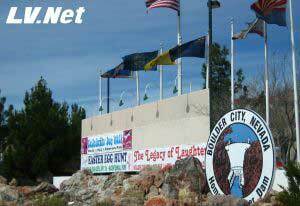 If you need high speed wireless microwave Internet or Wi-Fi in Boulder City please give LV.Net a call at 702-900-0000. We have the resources and experience necessary to provide for any high speed Internet need in Boulder City. LV.Net is ready and able to set up microwave Internet connections quickly in Boulder City without hassles associated with installing fiber optic cable. Have a convention or in need of temporary High Speed Internet 1Mbps to 1000Mbps in Boulder City call us now 702.900.0000 for a quote or email us. LV.Net © 1995 - 2018. All Rights Reserved.